Why green is the dominant color in our gardens; why there are variations in green and how we describe them. Of course there's some seasonal variation to this unrelenting greenness. 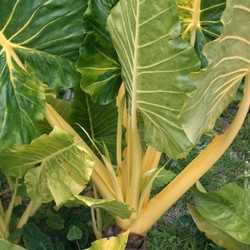 Chlorophyll production requires light and is newly manufactured in emerging leaves, which may thus appear pale--even yellow--in the spring. Its disassembly in autumn is the motivation for Sunday drives and fall getaways as the green fades and whole forests burst into flaming color. 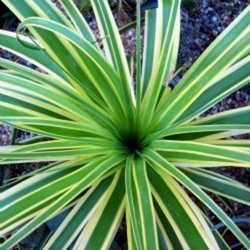 In addition, the appearance of foliage may be modified by the presence of surface waxes or hairs that lend a bluish or silvery cast to a plant, and air spaces under the leaf surface can give rise to white patches or spotting. But apart from these subtle differences, plants in the "natural" world (as distinct from our highly contrived gardens) don't exhibit a lot of variation in the color of their foliage. Given the prevalence of green, it is curious that there exist languages with no word for it. Some make do with only two colors, essentially "black" and "white." Languages that have a trio of terms invariably add '"red" as the third one. With more complex color vocabulary, green is acknowledged but might not be distinguished from yellow or blue. Clearly the speakers of these languages aren't gardeners. English has eleven "basic" color words: black, white, red, blue, yellow, green, orange, purple, grey, pink, and brown. Remarkably, leaves of horticultural varieties can be found in all these colors, often in elaborate combinations. Chlorophyll is still present, at least in parts of the leaf, but its greenness may be masked or modified by other molecules. Carotenoids, like chlorophyll, are membrane-bound pigments. In leaves they have an accessory photosynthetic function, absorbing wavelengths of light not available to chlorophyll. Both dying leaves and plants that have been bred for yellow foliage are showing off their carotenoids. These molecules are also responsible for the yellow, orange, and sometimes red of other plant parts. Think carrots and marigolds. Anthocyanins are H2O-soluble molecules found in vacuoles, the cellular equivalent of water balloons, and can darken leaves or brighten them. Wine-colored spring foliage contains anthocyanins, as do the autumn leaves of maples, oaks, and sumac. In flowers these molecules manifest themselves as purples, pinks, blues, and reds. The color can be altered to some extent by pH, as anyone knows who has grown Endless Summer hydrangeas. Even temperature can have an effect: phlox 'Blue Paradise' is indeed blue on cool mornings but pinks up as the temperature rises. To the unsuspecting, these color shifts can come as quite a surprise. Woody plants such as smokebush and maples may have season-long reddish leaves, and numerous varieties of shrubs and herbaceous plants sport golden foliage. Even some cultivars of evergreens might better be called "everblues" or "everyellows." Dahlia, Ajuga, and Actaea all have non-green representatives, and Coleus brightens the shady corners of our gardens with its cheerful multicolored patterns. The aptly named 'Black Pearl' pepper (Capsicum annuum) must have among the darkest leaves in the plant kingdom. But surely the prize for improbability in a chlorophyll-dominated world goes to the genus Heuchera and its Tiarella hybrid, Heucherella. 'Black Beauty' and 'Obsidian,' for example, rival the inkiness of black pearl pepper. 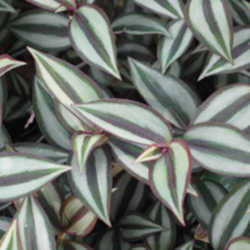 But leaf colors in these genera aren't only dark. They run the gamut: plum, amethyst, mahogany, crimson, berry, amber, coral, caramel, terra-cotta, copper, silver, lemon, champagne, chartreuse. Clearly the basic eleven of English are inadequate to describe the rainbow of possibilities that belie the presence of chlorophyll in coral bells. We do our best to camouflage its presence in our gardens, but green is always there, manufacturing the sugars that not only support the plant itself but are the basis for life's food chains. It's a tranquil color as well as a useful one, a foil for our more somber or festive choices. So don't disparage it. Go green, give chlorophyll the green light, make your neighbors green with envy. A green thumb's up and sun hats off to the world's most important color. For (almost) 7 months of the year, Susan rearranges plants in her 30 year-old Minnesota garden. When the ground freezes and the snow flies, she turns her attention to the study of the Italian language, on the principle that one is never too old to learn.